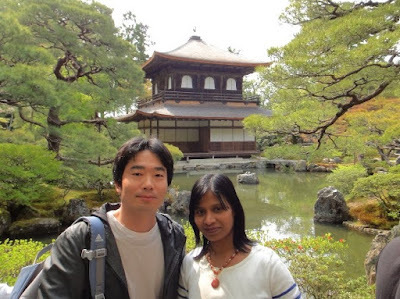 As I wrote in the previous post, on the morning of 30th April hubby and I visited Kinkakuji Temple in Kyoto. 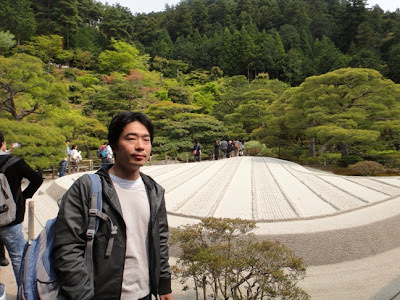 In the afternoon, we visited Ginkakuji Temple about which I will write in this post. 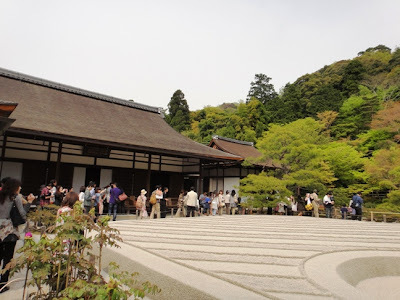 Ginkakuji Temple is the more common name for Jishoji, a temple belonging to Shokokuji branch of Rinzai sect Zen Buddhism. 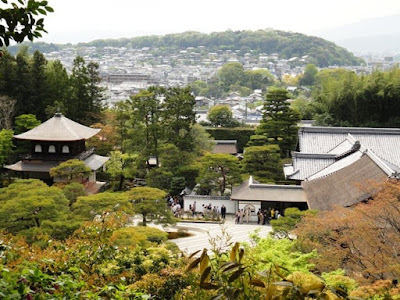 The temple is located at the foothills of Higashiyama eastern mountains in Kyoto, and is an outstanding example of the Higashiyama culture of Muromachi period. 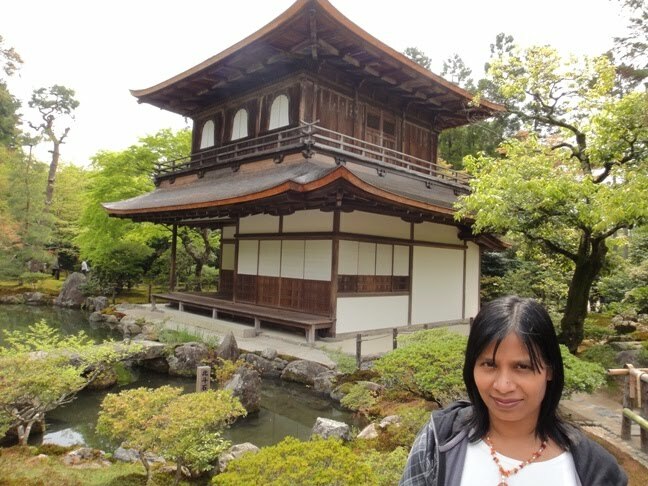 The temple is one of the major sightseeing places in Kyoto. The temple is famous for its two-storied Kannon hall named Ginkaku silver pavilion. 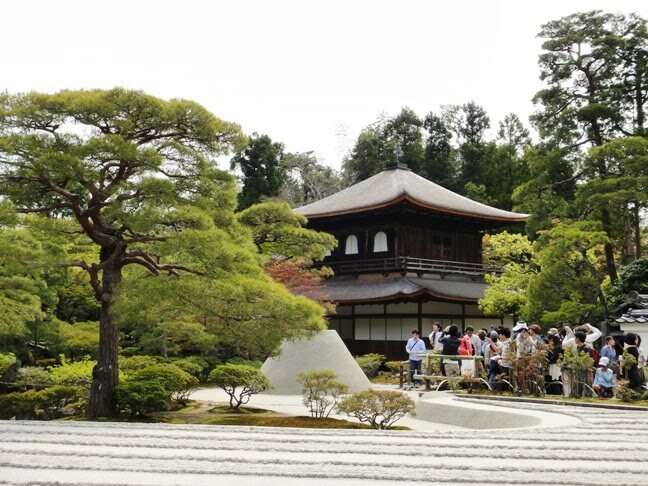 This silver pavilion is the symbol of Jishoji Temple, and has given the temple its more popular name of Ginkakuji. Ginkakuji complex was originally not a temple but was a retirement villa of Ashikaga Yoshimasa, the eighth shogun of Ashikaga Shogunate during Muromachi period. 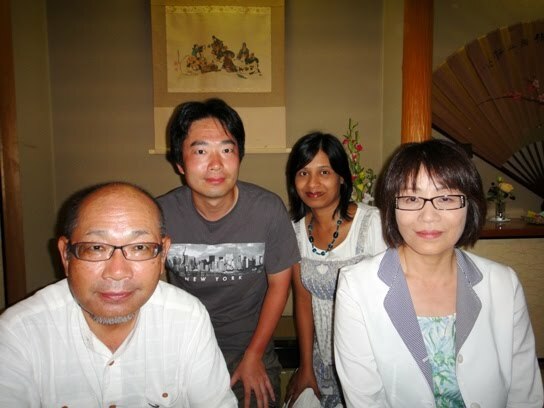 Although Yoshimasa was intellectually gifted, he was a poor administrator. So he handed over power to his younger brother Yoshimi in 1464 but soon afterwards tried to install his young son Yoshihisa as a shogun. This led to Onin war that destroyed much of Kyoto. 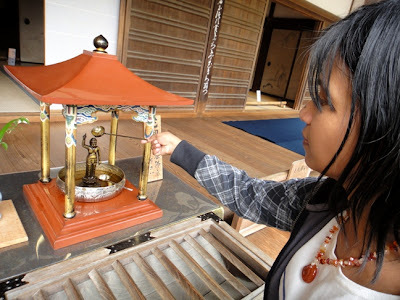 A temple named Jodoji, the former residence of Yoshimi, was burned down during this civil war. 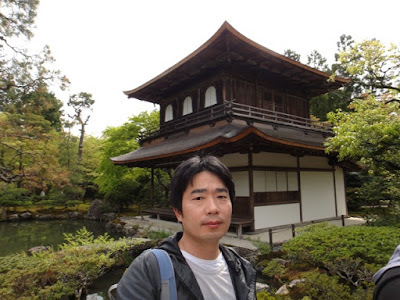 After the war Yoshimasa, who was already in retirement, decided to construct a new residence on the former site of Jodoji Temple. In 1482, Higashiyamadono palace was established at the site. 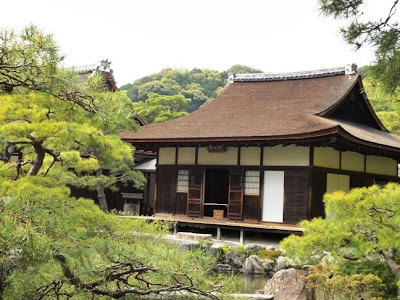 This palace served as Yoshimasa’s home from 1483, where he lived a peaceful retired life by holding Noh plays, tea ceremonies, moon gazing, and enjoying things of an aesthetic nature. He continued making many buildings inside the palace complex, and the construction of Ginkaku silver pavilion began in 1489. However, he fell sick and died in 1490 without seeing the structure completed. He was not able to coat the pavilion with silver-leaf which he had intended to do in imitation of Kinkaku golden pavilion built by his grandfather Yoshimitsu. 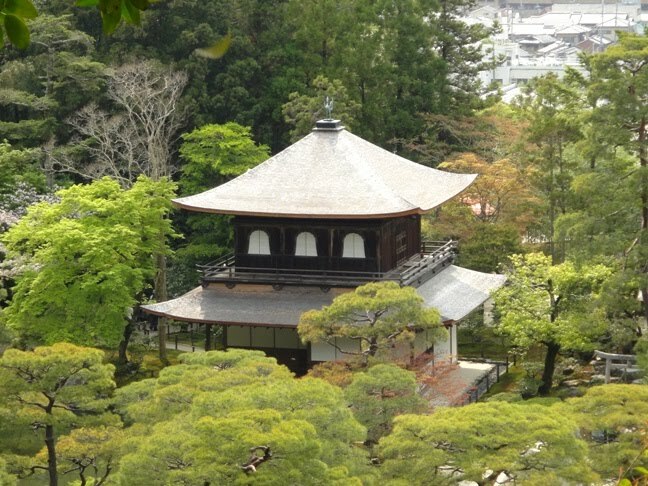 Although no silver was ever applied to the pavilion, the name ‘Ginkaku’ lives on. This unfinished appearance illustrates one of the aspects of wabi-sabi quality. A total of 12 buildings and an expansive garden were completed until Yoshimasa’s death. 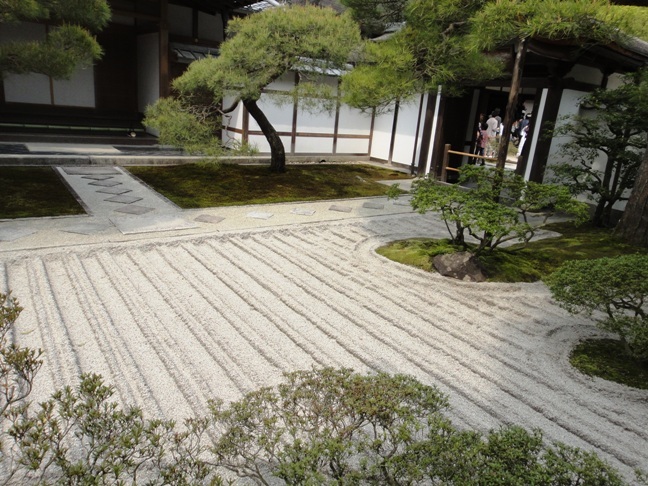 Upon his death, the villa was transformed into Jishoji Zen temple in accordance with his will. Due to the decline of Ashikaga family in the following century, the temple was neglected and many buildings were destroyed. In 1615 during Edo period, a large-scale restoration of the temple was carried out. 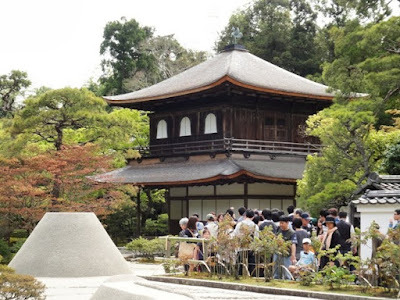 In fact, Ginkaku silver pavilion and a building named Togudo are the only original buildings from Muromachi period that remain standing in the temple complex. All other buildings as well as gardens date back from Edo period. This temple was designated as a UNESCO world heritage site in 1994. Ginkakuji Temple is located about seven kilometers east of Kinkakuji Temple and it took us 30 minutes to reach there by taxi. After getting down from the taxi, we walked uphill along a narrow road lined with souvenir shops and restaurants. 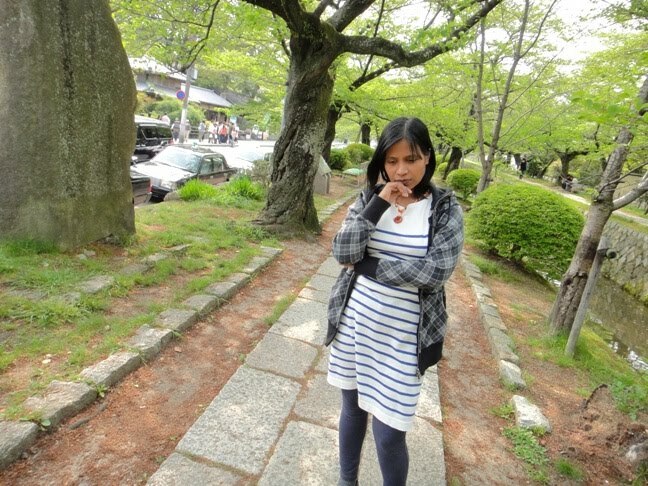 After 10 minutes of walking, we reached Somon main gate of Ginkakuji Temple. 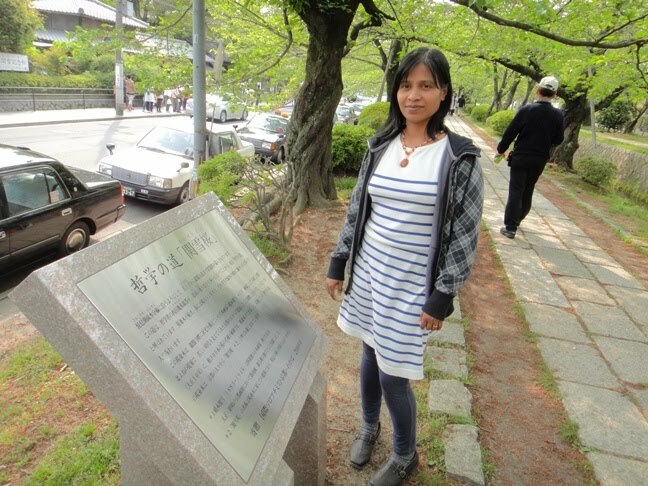 A stone monument inscribed with words ‘old precincts of Jishoji Temple ruins’. 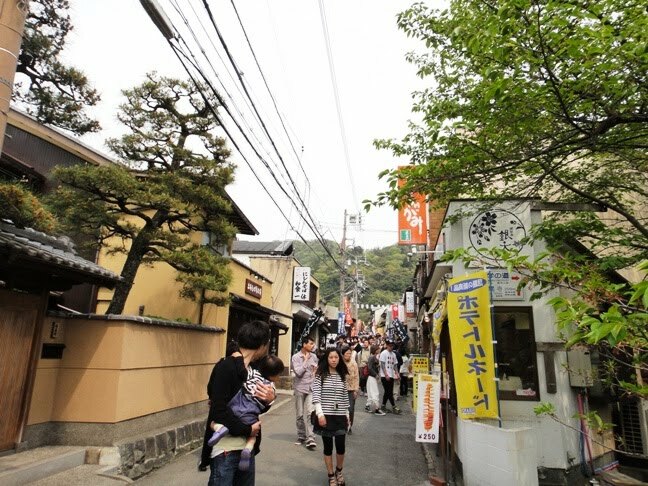 This area was inside temple precincts prior to Edo period reconstruction. 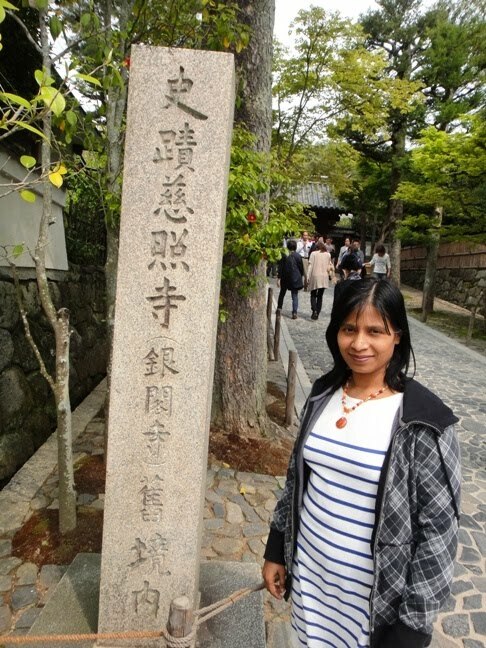 After entering the grounds of the temple, we walked on a fifty meter long beautiful pathway between the main gate and the inner gate. 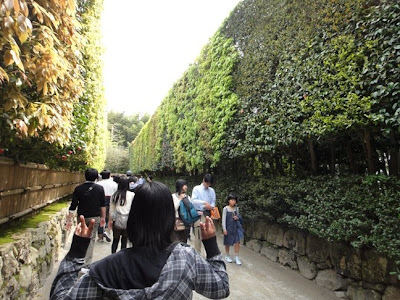 The pathway is lined with distinctive type hedges made of stones, bamboos, and camellias. These hedges are made in a style known as Ginkakuji-gaki style of fencing. At the end of the pathway, we turned left and reached a ticket booth where we purchased tickets worth 500 Yen per person as admission fee to the inner sanctum of the temple precincts. We also received a paper talisman along with the tickets. Next, we walked through Chumon inner gate that took us to the inner grounds of the temple. 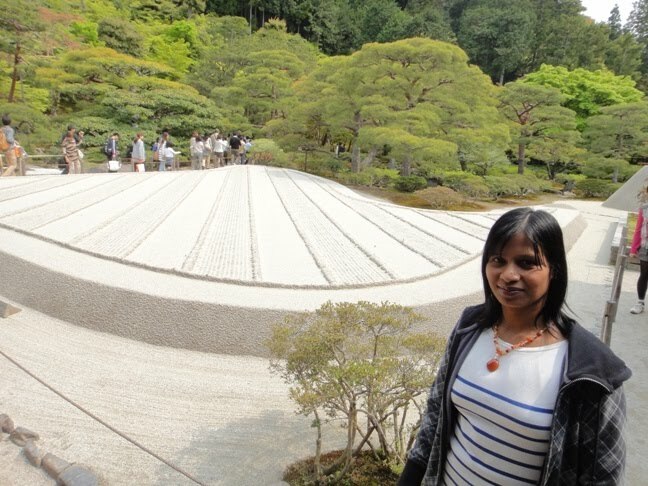 The temple complex was so serene and we caught a glimpse of a unique sand garden. 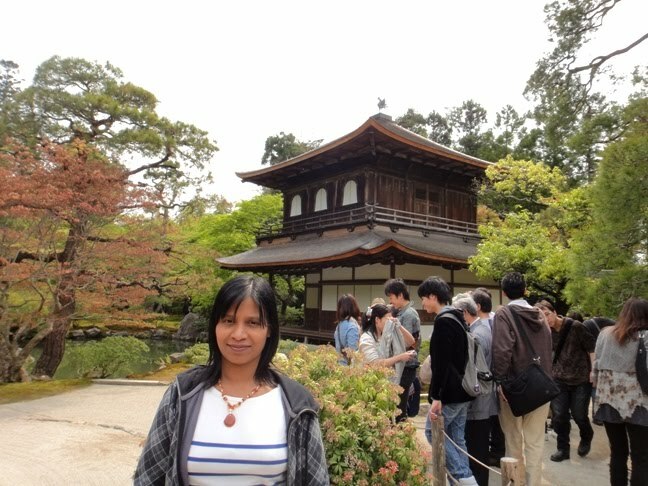 Just after entering the temple grounds, we got the first sight of Ginkaku silver pavilion to our right. There is a beautiful green pond in front of the pavilion. The silver pavilion is also called Kannon hall. It is a simple two-storied building with a wooden exterior. 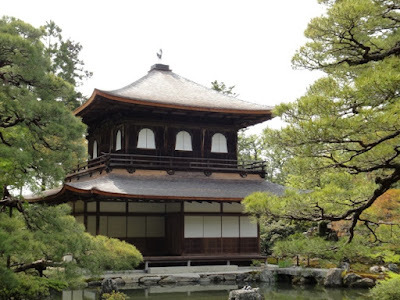 The pavilion is one of only two buildings on the grounds of the temple complex that is an original Muromachi period structure and has survived for more than five centuries. The building is designated as a national treasure. The two stories of the pavilion are constructed in two different architectural styles yet the two harmonize with each other and create an outstanding effect. The first floor is known as Shinkuden and is 5.5 meters by 6.7 meters in size. This floor is built in Shoin style which is a traditional residential architectural style. This floor contains an image of Jizo Bosatsu. The second floor called Choonkaku is built in Chinese temple architectural style. This floor contains an image of Kannon Bosatsu that is believed to have been created by Unkei in the 13th century. This floor has bell shaped windows and is surrounded by a small railing. The interior of this building is not open to the public. Atop the building roof, there is a bronze statue of phoenix facing east that constantly guards over the temple. The outside of the pavilion building was intended to be coated with silver-leaf although it was never applied. The simplicity of this building makes its beauty remarkable. Right after entering the temple complex we were too near the pavilion building, and so could not view the roof top architecture properly. 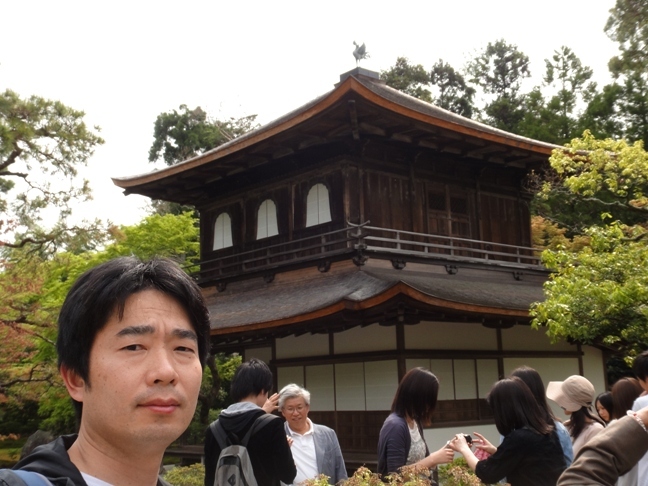 I am standing in front of the silver pavilion. Green pond is also seen next to the pavilion. Next, we walked towards our left inside the temple complex. 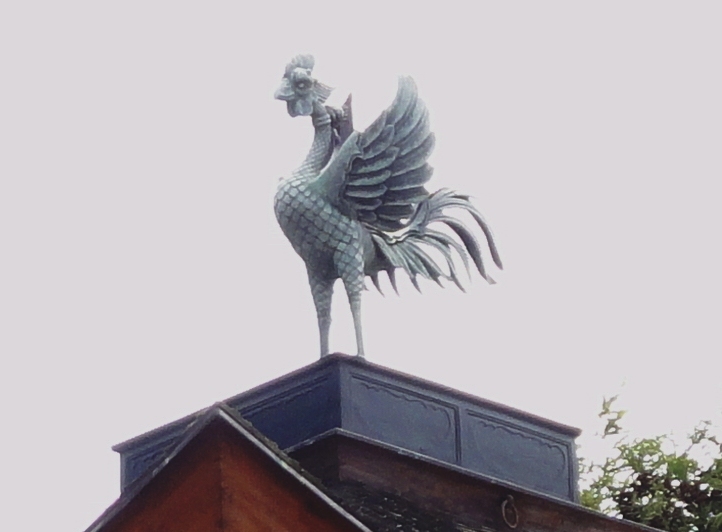 Now we were a bit further from the silver pavilion, and got a beautiful view of the bronze phoenix atop the roof of this building. Along the walking route to our left we saw a building which is the abbot’s quarters. 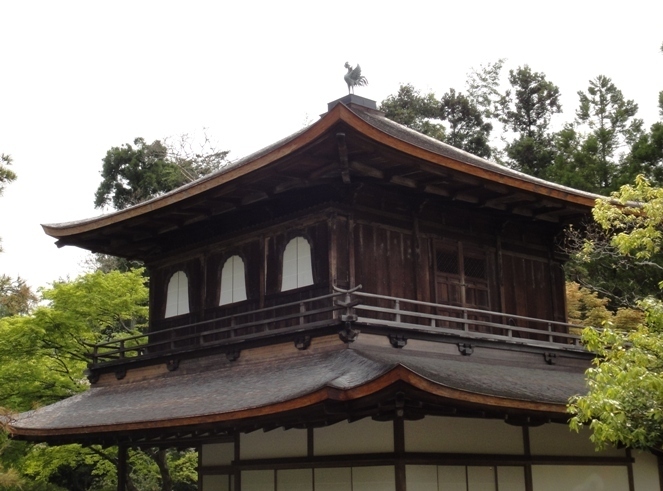 This building, named Hondo, is the main hall of the temple complex and dates back to Edo period. The principal image of worship inside the hall is a statue of Shaka Nyorai. This building is fragile and therefore closed to general public. There is a fantastic sand garden in front of the building. We saw that a small flower shrine named Hanamido was placed in the corridor of Hondo main hall to celebrate Buddha’ birthday. A statue of infant Buddha was placed in the shrine and I poured sweet tea over the figure as if bathing the body of baby Buddha. 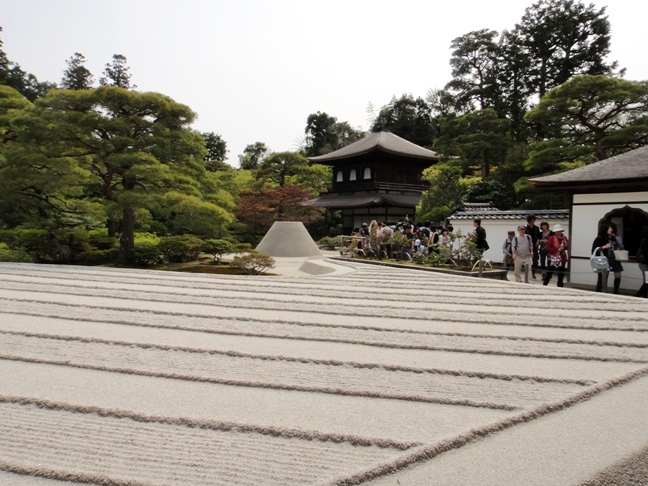 After praying at Hondo main hall, we turned around and saw an expansive meticulously maintained dry sand garden known as Ginshadan or the sea of silver sand. The garden consists of a 0.6 meters high platform of sand covering 7100 square meters of the ground, and is meant to be viewed as a sea. It is a wonderful sight and seems to resemble a calm, peaceful, silver sea. 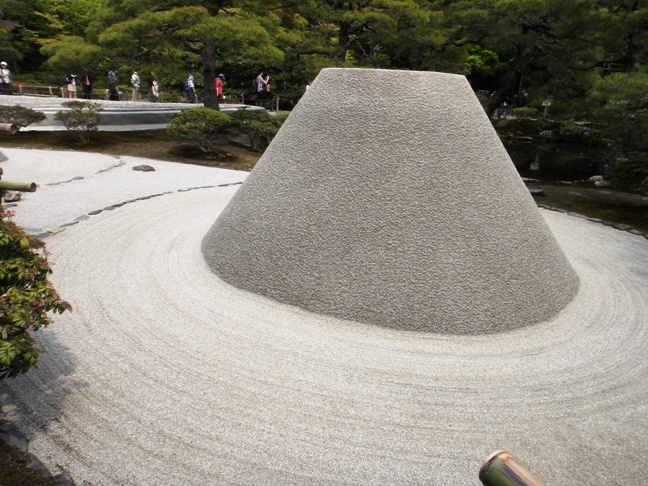 Adjacent to this garden towards the silver pavilion, there is a distinctive cone-shaped sand structure rising 2 meters into the air. This is called Kogetsudai or the moon-viewing platform. Legend has it that the sea of silver sand is meant to reflect the light of the moon, while the moon-viewing platform was meant to sit on while waiting for the moon to rise from Higashiyama mountains. These landscape features were added only in the 1600s during Edo period and were not part of the temple complex during its Muromachi period glory days. On our walking path, adjacent to Hondo main hall was another building named Togudo hall of the eastern quest. This hall is another one (along with the silver pavilion) of the two buildings in the temple complex that is an original Muromachi period structure. The building is designated as a national treasure. 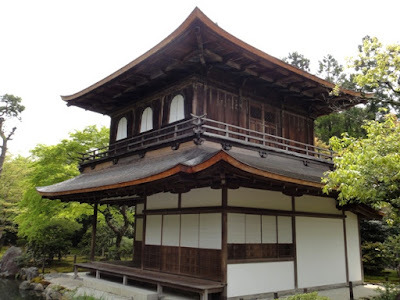 It was constructed in 1486 and was the personal Buddha hall of Yoshimasa. He took up residence in this building while living at the villa. 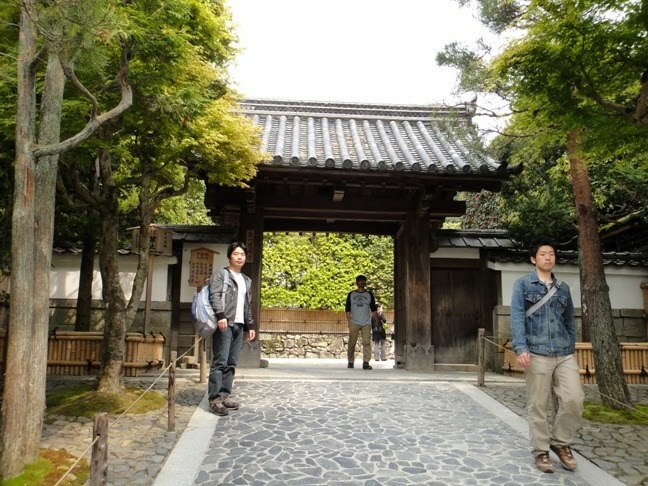 It is the oldest Shoin style building existing in Japan. 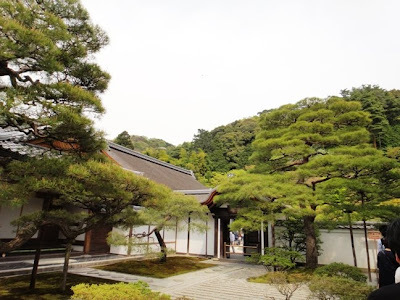 The hall is single-storied with Irimoya style roof thatched with sawara Japanese cypress. Inside the building there is a 4.5 tatami mat room called Dojinsai in the northeast side, which is thought to be the origin of Higashiyama culture. It is also said to be the beginning of Soan style tearoom and 4.5 tatami mat rooms. The interior of the building is not open to the public. We took the photo of this building from across Ginshadan sand garden. We walked along a paved path adjacent to the sand garden and reached a spot from where we got an exquisite view of Ginshadan sand garden and Kogetsudai sand mound along with the silver pavilion in the background. The contrast between the dark pavilion and the white sand of the garden and mound looked splendid and flawless. As we walked further along the path, we saw a beautiful moss garden that features ponds with various compositions of rocks, islands, bridges, streams, and plants. The path then climbs up a hill behind the buildings. From the highest point on the path, we got a nice view of the entire temple grounds and the city beyond. Then we started coming down the walking path and once more enjoyed a closer view of the silver pavilion and the green pond in front of it. In fact, I loved this view of the pavilion the best. Hubby and I are standing in front of the silver pavilion. Green pond is also seen in front of the pavilion. After this, we exited the temple precinct and started walking back downhill along the narrow road lined with souvenir shops. 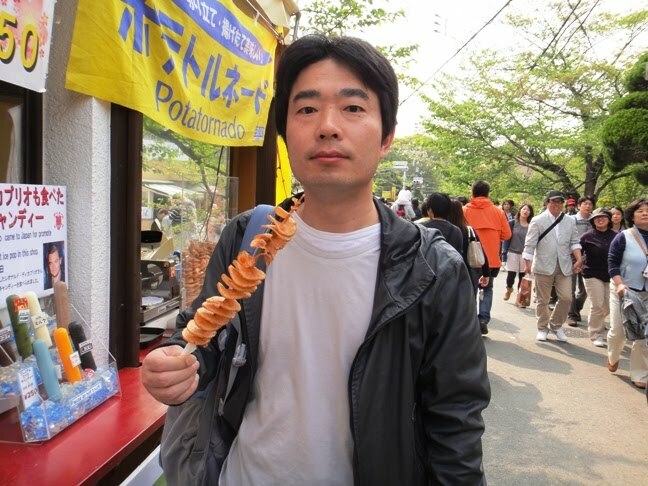 Here at one of the food stalls we enjoyed a snack named potatornado, a spirally sliced French fries. 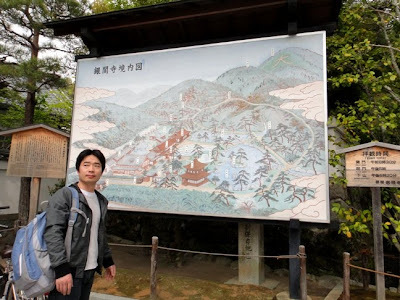 Next, we walked along the famous philosopher’s path named Tetsugaku no michi, which is a two kilometer long pedestrian stone path that begins around Ginkakuji Temple and ends in the neighborhood of a temple named Nanzenji. The path follows a canal which is lined with hundreds of cherry trees. 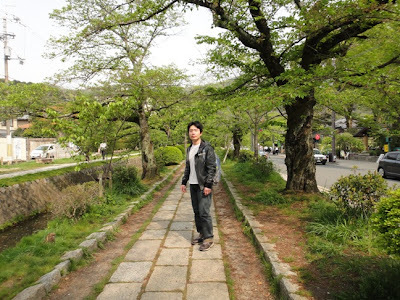 The path is named after Nishida Kitaro who was said to practice meditation while walking this route on his daily commute to Kyoto University. It was nice to walk on this path surrounded by cherry trees with fresh green leaves. On an adjacent main road, we saw several man-pulled traditional vehicles called jinrikisha which are a major tourist attraction in Kyoto. 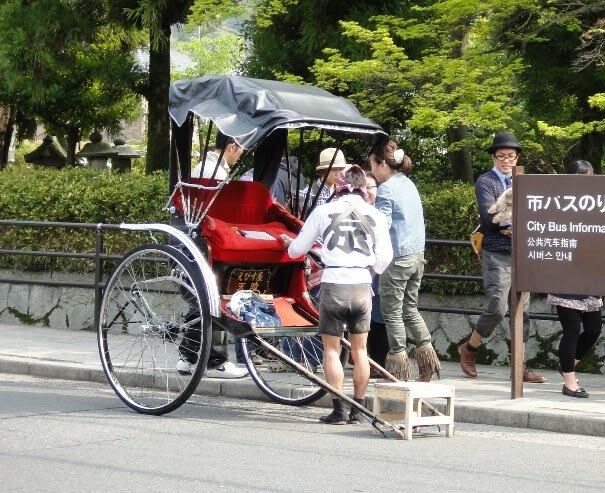 I wished to ride a short distance in jinrikisha but we did not have much time. We loved the simple and serene atmosphere of Ginkakuji Temple. 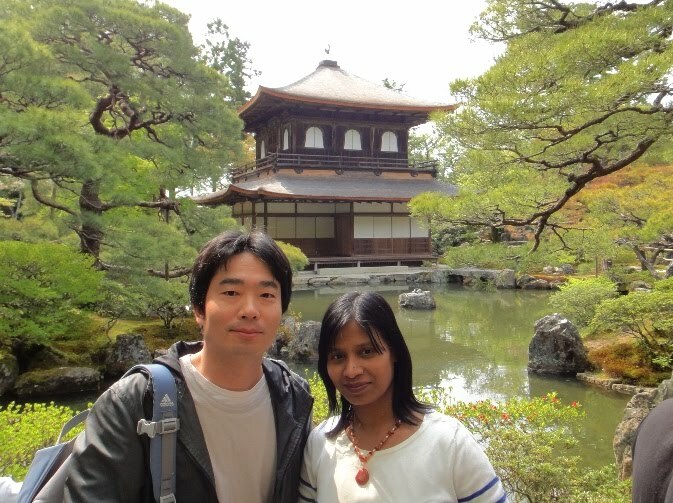 Next, we visited Kiyomizudera Temple about which I will write in the next post. 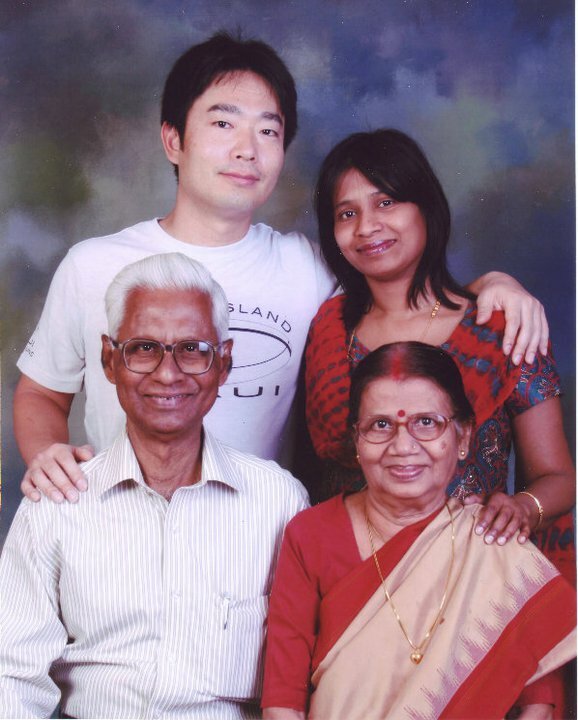 Thanks Sonal for liking the pictures. Hope you enjoyed the virtual trip to Ginkakuji Temple. hello, thank you for this good article and lovely pictures. I would like to know where I could find the Temple's dimension ? do you know where is this information ? Thanks Anna for your comment. 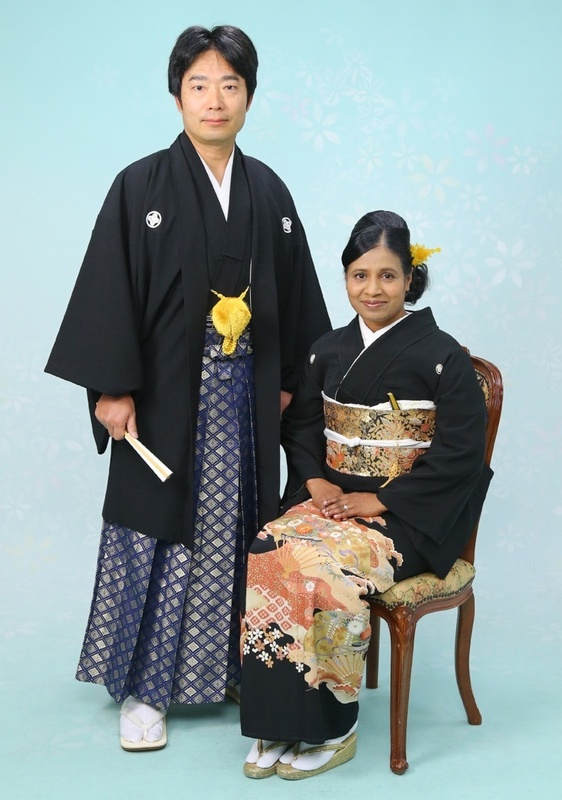 It has been more than two years that we visited the temple. 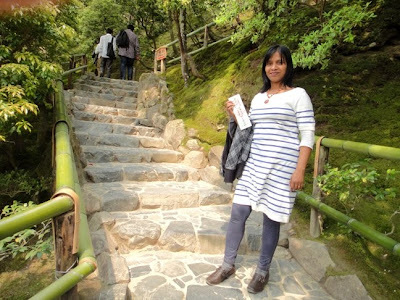 If I can get the information about the temple dimensions, I will surely let you know... Do you need the dimensions of only the golden temple or the entire temple complex including the gardens? Thanks for your comment hanni naaf. It has been five years since we visited Ginkakuji Temple. Now I do not have any dimensions of the temple with me as I have thrown away all the information brochures. May be we should try google search :). I will try.